Transforming your home into the perfect modern farmhouse can definitely feel like an insurmountable challenge. You want it to feel charming and cozy without being shabby chic, and you want to incorporate older vintage pieces yet still feel modern. You're not alone. So why not learn to master this balancing act in one of the most central rooms in the house? Your dining room. 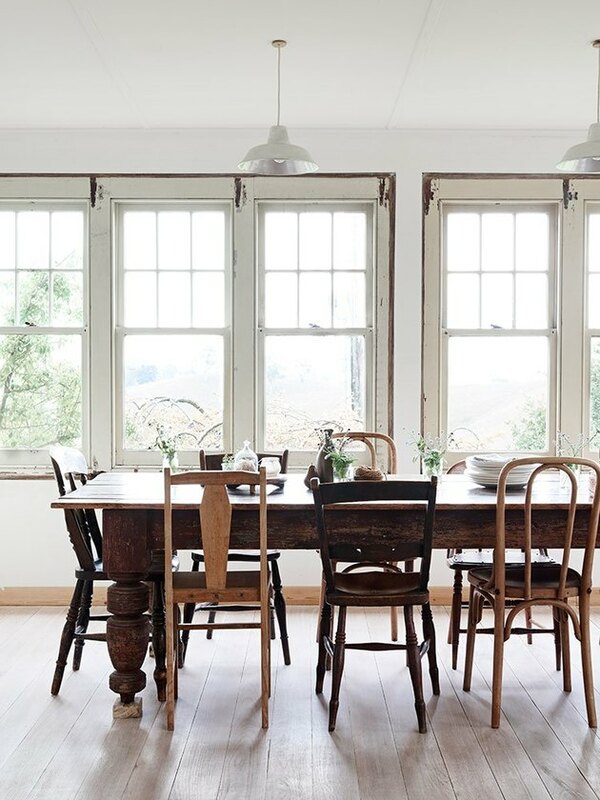 And to get you started we've found 14 rustic spaces that will inspire farmhouse brilliance. 1. White and metal make a great match. The rustic trend may not lend itself super well to bold colors, but that doesn't mean your space can't have pizzazz. 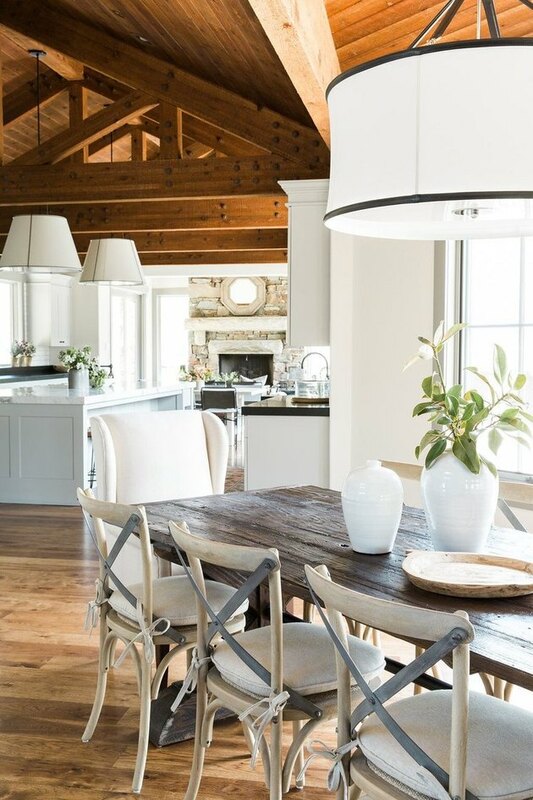 Kelly from The Lily Pad Cottage paired her Windsor style chairs with a black steel frame pendant light (and, of course, a little wood) to create a picturesque country nook. 2. A touch of luxe goes a long way. 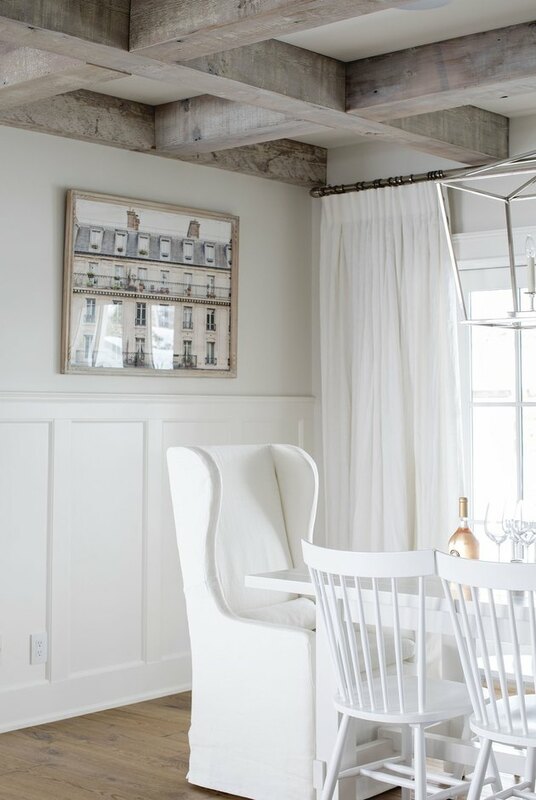 Cecily from Cecy J Interiors gave this family farmhouse an elegant new makeover. With the help of a little white paint and a few luxe accents — like a brass pendant light — made all the difference. 3. A vintage table completes the look. 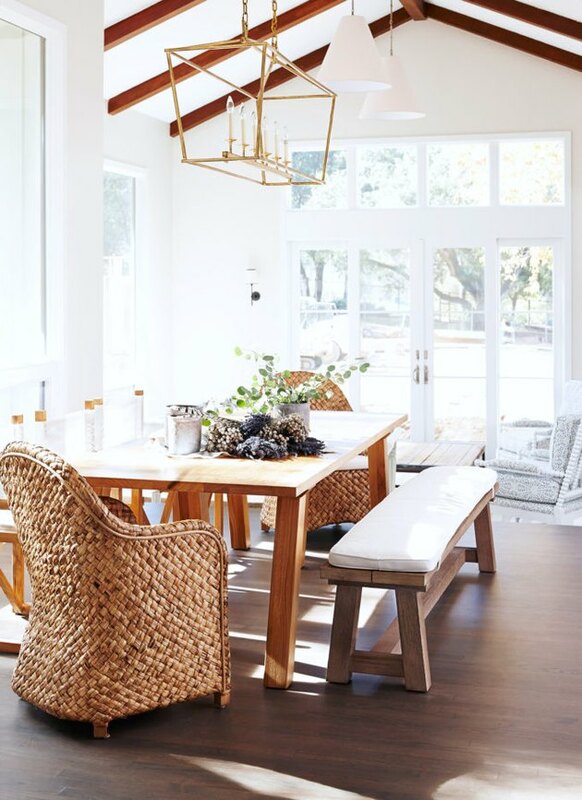 The dining room may be delightfully modern, but the heavy vintage farmhouse table, which is over a century old, grounds this picture-perfect room shot by Eve Wilson in rustic style. The perfectly mismatched dining chairs don't hurt either. 4. Do it yourself to decrease the price. 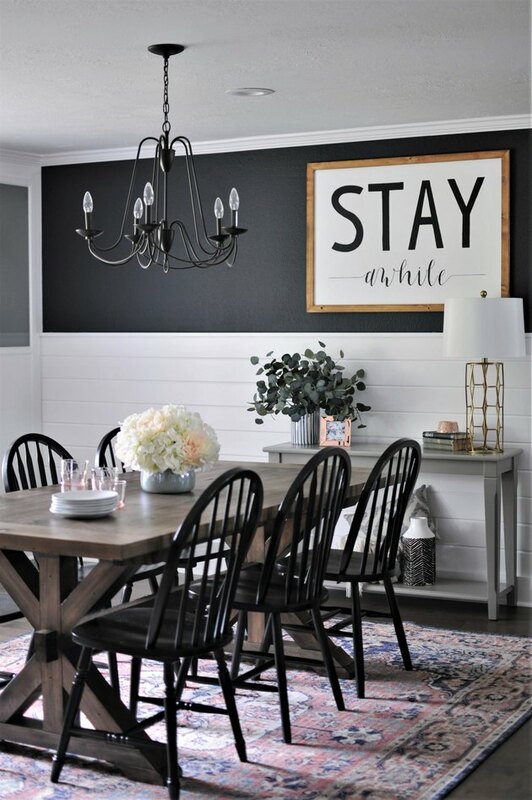 A properly rustic room should feel a little handmade — and this DIY-ed "Stay Awhile" sign by Joyful Derivatives blogger Rachel Joy is just the thing to perk up your farmhouse-style dining space. (Plus, who can argue with inexpensive decor?) Follow her how-to here. 5. Dark wood adds drama to an airy space. 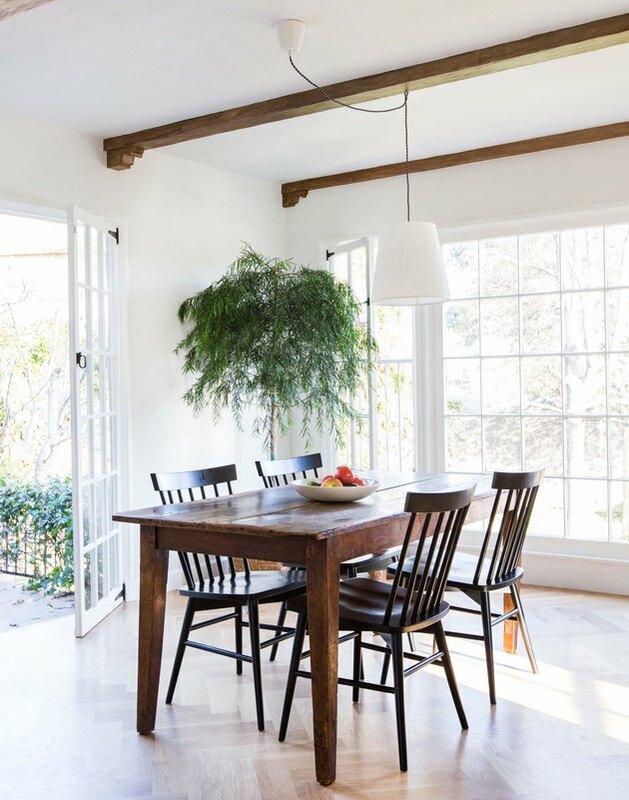 Large windows, lots of air, white walls — the last thing this beautiful bright space needs is a white table. Pick a killer dark wood piece like Emily Henderson did, and give it the spotlight to create your dream rustic dining room. 6. Wood walls aren't all bad. Why paint your walls when you can clad them with wood to get the rustic look you've been craving? 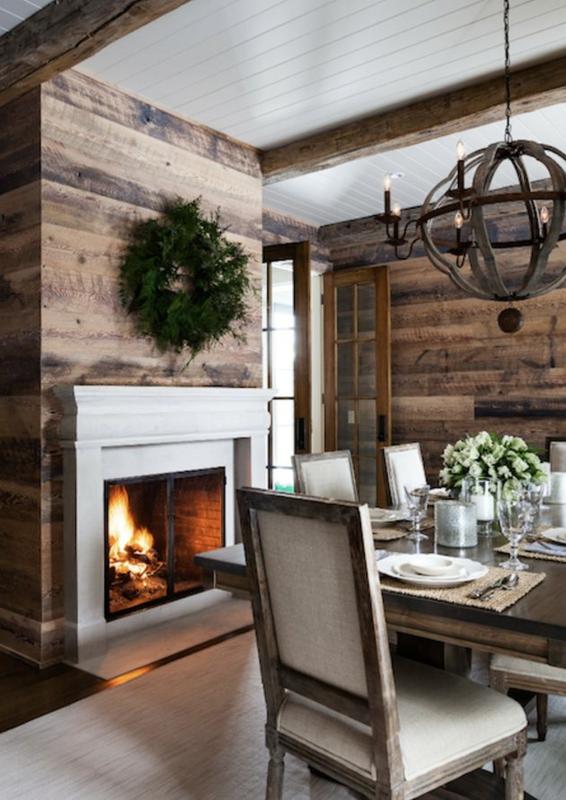 In fact, this space proves that adding horizontal planks to your dining room will give it distinct personality and country charm. 7. Just because it's rustic doesn't mean it can't be glam. A crystal chandelier ... in a farmhouse dining room? Sounds contradictory, but this Newport Beach home proves that the combination works. The key to success? 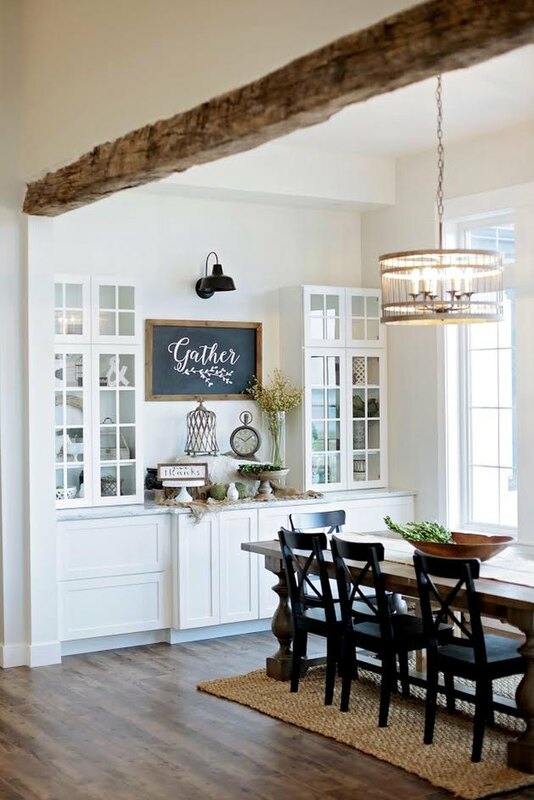 Find a fixture that incorporates blackened steel or bronze to give it a hint of rustic flair. 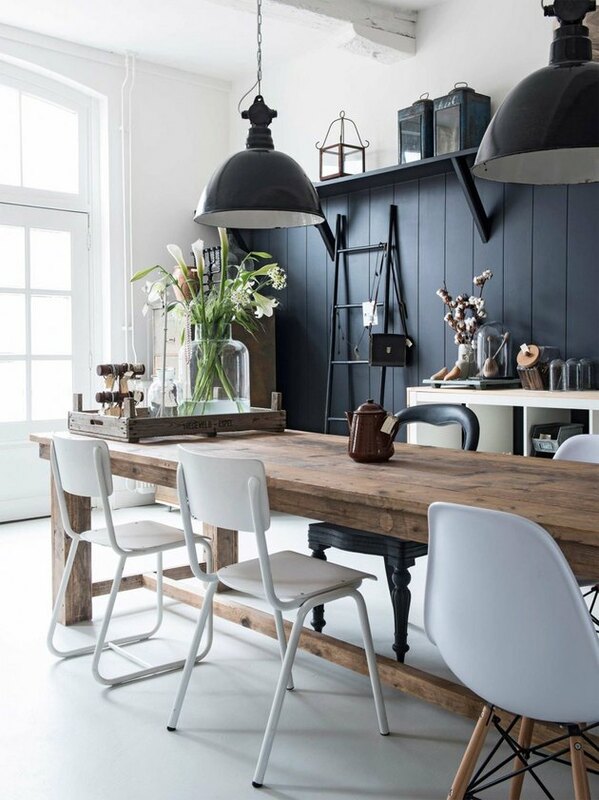 There's one color that works fabulously with rustic decor: Black. Emily Starr from mStarr Design incorporated an ebony china cabinet and black picture frames in her dining room to add striking contrast. 9. Or keep it all white. 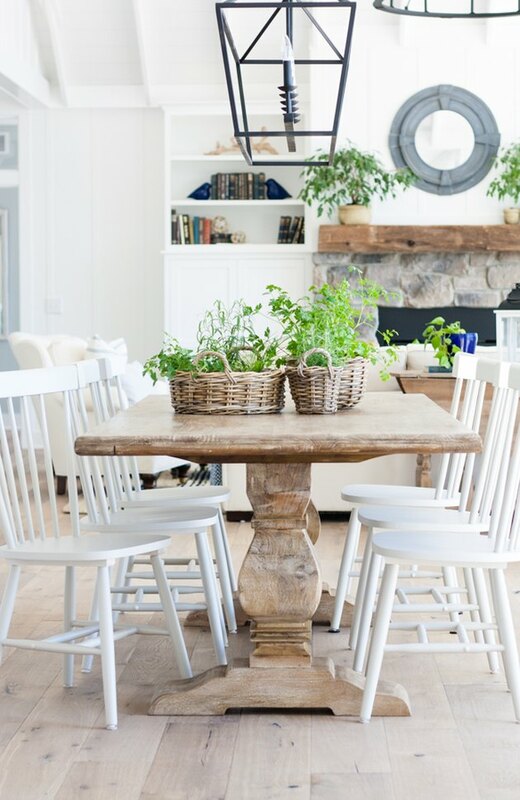 You can opt for something a little less bold like Jillian Harris' dreamy farmhouse-style dining room. From the walls, to the furniture, to the drapery, she kept everything white to balance the warmth of the wood flooring and ceiling. 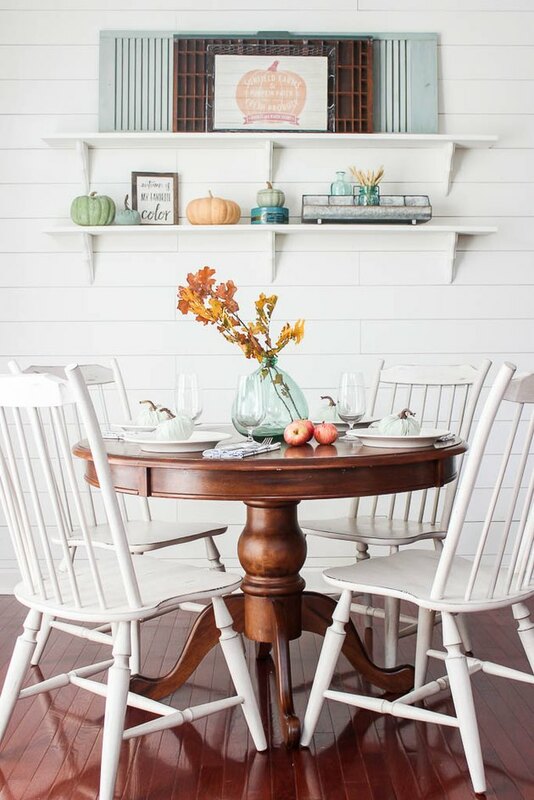 Rustic dining tableaus like this sweet autumn setup provide the perfect backdrop for seasonal decor. After all, rustic works beautifully with natural elements — and the best, most unobtrusive seasonal decor is all about nature. For summer, choose bright flowers; for fall, embrace wheat and squash. 11. Consider adding industrial flair. Some of the most beautiful spaces combine two styles: Scandinavian and minimalism. Midcentury and bohemian. And rustic and industrial. 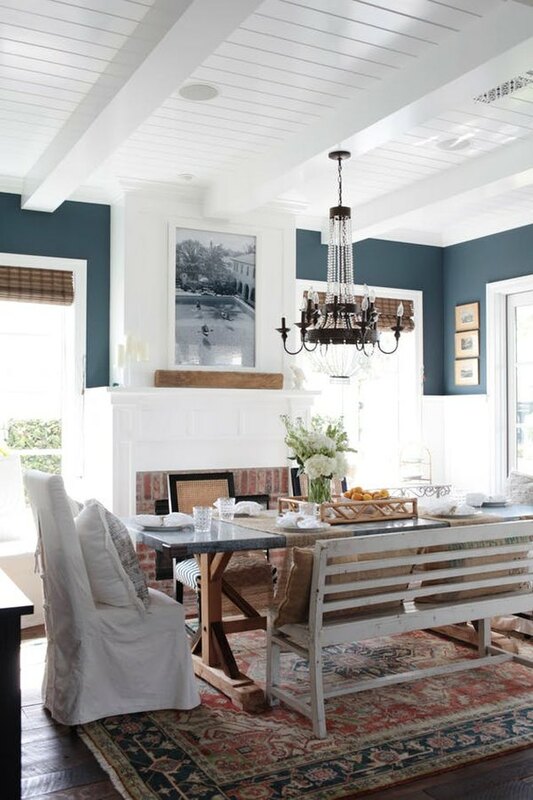 By the mere addition of two black factory style pendant lights and an accent wall, this country dining room is instantly transformed from charming to chic. 12. Feminine florals create natural elegance. Want a sophisticated look for your rustic dining space, without sacrificing that country feel you know and love? 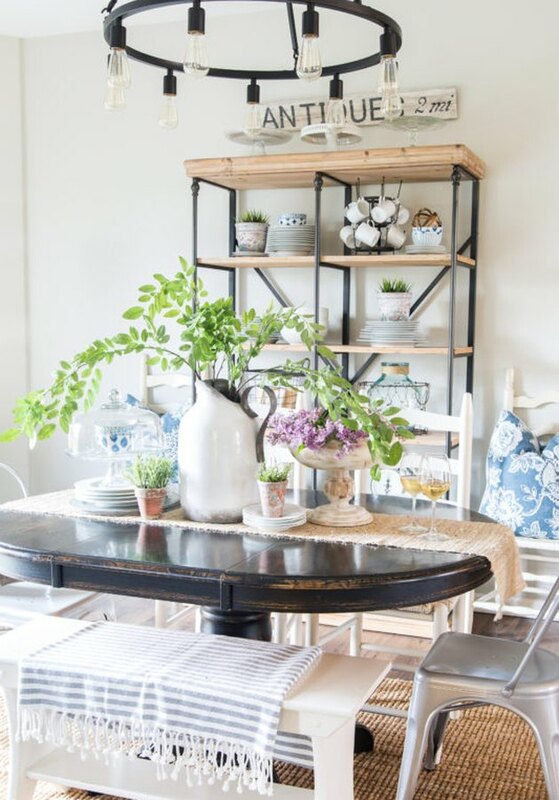 Add a lovely floral arrangement to the center of your farmhouse table for an elegant touch like Shea from Studio McGee did in this stunning Park City, Utah abode. 13. It's all about the table settings. Don't just let your stunning wood tabletop sit bare. 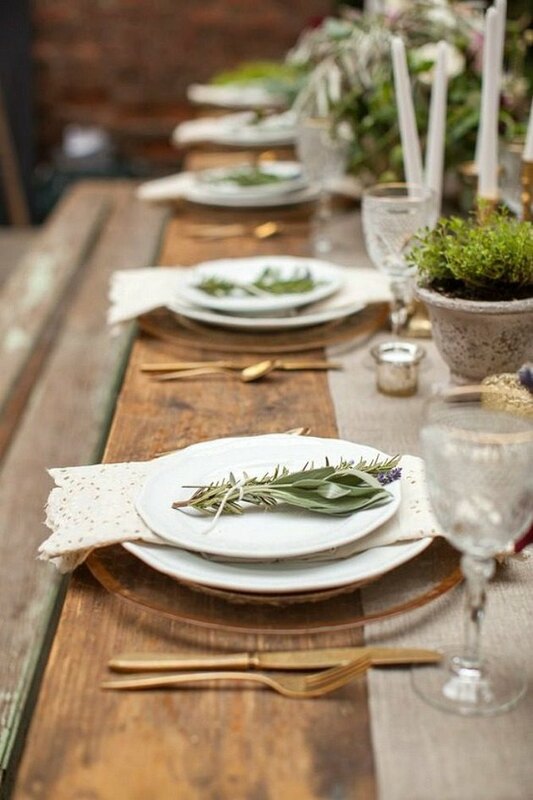 Whether you add a sprig of rosemary to the plates or roll up soft linen napkins, take the time to perfect your place settings like these by Sarah from Seasons by Sarah. All of the quaint little details won't go unnoticed. 14. A large space isn't necessary. You don't need an expansive floor plan to take advantage of the rustic trend. Jennifer from Delightfully Noted gave her modest dining room a pastoral makeover thanks to a perfect wood table, some farmhouse-style chairs, a clear vase filled with seasonal blooms, and a bit of greenery.